Are you having trouble getting everything in focus? Use a depth of field calculator to maximize your DOF! Create the stunning photos of your dreams. What is the depth of field anyway? Extremely useful, a depth of field calculator comes in handy! Defined, depth of field (DOF) is the acceptable sharpness in a photograph that extends before and after the focus point of a subject. Much debated, this area of sharpness can be argumentative; however, I feel the best way to decide what is “acceptable” sharpness is to view the photograph either on a computer screen or printed at approximately the same size as an 8×10. Now, when viewed from the perspective of a person looking at the photograph hanging on a wall, if it looks sharp, it’s probably good enough for most of us. Please try to keep in mind; anyone can blow up an image to 200 percent or use a microscope to find a flaw, with that said, it’s really up to you. However, I think we have to be somewhat reasonable when it comes to defining “acceptable” sharpness. Why not just put the camera in auto? Having discussed acceptable sharpness, it’s now the burden of the photographer to decide where and how much DOF to apply. For example, you may decide on using a very shallow DOF, creating a beautifully blurred background with only a small area of the image in focus, such as the width of a flower. Additionally, this effect, also known as bokeh, is not only stunningly beautiful but may also block out distracting or unwanted background objects as well. The decision is best made by the photographer, NOT the camera. Some may find auto mode useful, but for better control of the depth of field, I recommend priority modes or full manual. Do I need a depth of field calculator? Take a look at the photograph below, and observe the focus point near the ring in the bamboo. Captured with an aperture of f/2.8, you’ll notice the shallow depth of field just above and below the ring. In particular, how does one know what settings to use or at what distance the camera should be positioned from the subject? Making use of DOF charts is one method of calculation, although simple, they may require a set of reading glasses or a jewelers loop to read. Over time, experience and trial and error can certainly assist in honing one’s skills, and there’s nothing wrong with that! Be that as it may, if you have a desire to eliminate the guesswork and ensure the highest accuracy, then consider using a depth of field calculator. For the last couple of years, I have used the SetMyCamera app for iPhone with fantastic results. A DOF calculator is a handy tool, especially for hyperfocal distance. The first bamboo ring was the focus point I had selected in this image. With just a basic understanding of DOF and a little trial and error, the shallow depth of field in this photo can be captured without the use of any calculations; although conversely, more complicated scenarios arise making it harder to judge the DOF. Moreover, If you have a specific goal in mind, such as attempting to maximize your DOF using the hyperfocal distance (not discussed today), your calculations may require better accuracy. 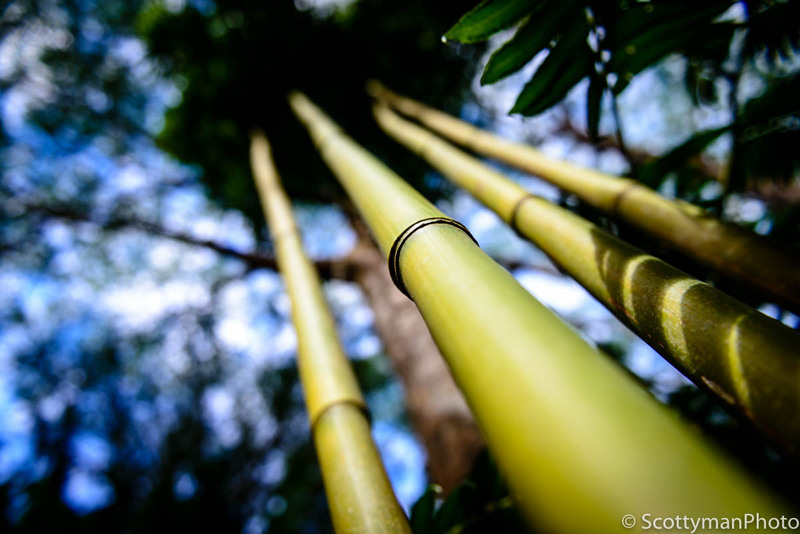 This is a beautiful image of bamboo captured in Oahu Hawaii. I wanted to lure the viewer into the photo using a shallow depth of field. Most smartphone apps are reliable and simple to use. Although many apps are available for free or purchase, the SetMyCamera app is fast, accurate, reliable, and does not require cellular service to function in the field, a handy feature, while deep in the countryside. Additionally, dial in the desired settings and distance, and you’ll see the near and far focus limits, it’s that simple! Additionally, note the hyperfocal distance displayed at the bottom; this is useful information if your goal is to get everything you can in focus. Although not infallible, this app does require some depth perception on behalf of the user. Nevertheless, it’s still an impressive tool. 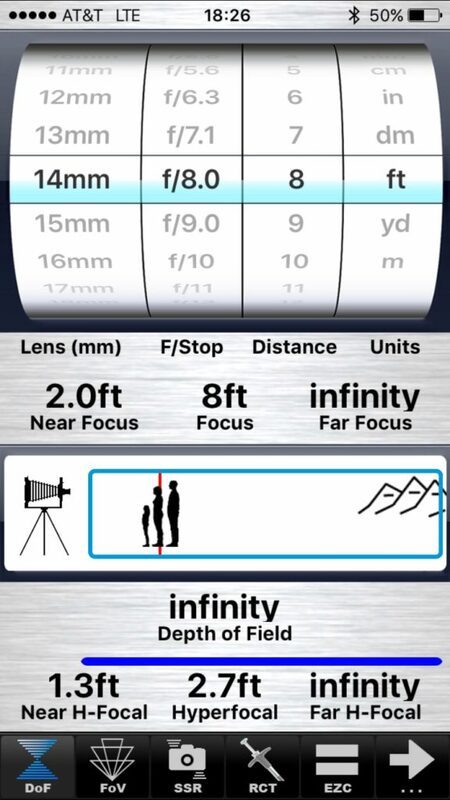 A screenshot of the depth of field calculator for the SetMyCamera app. This app accounts for many different types of cameras and sensors available in the market, an extensive list of options allows the user to select a specific camera to receive the proper depth of field data. 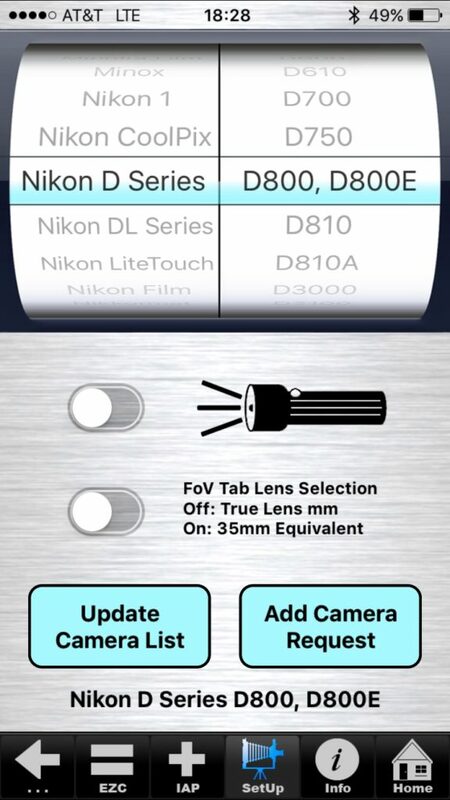 A screenshot of the camera selection screen for the SetMyCamera app. In summary, get yourself an app! Although more than one option is capable of accomplishing the same task, if you’re looking for a convenient and reliable choice, try a depth of field calculator. After using a couple of different apps, I would not hesitate to recommend SetMyCamera. With four available options ranging from free to the Pro version for $5.99, it’s an easy day.